“To the best of my knowledge, no war was ever started by women. But it is women and children who have always suffered the most in situations of conflict." 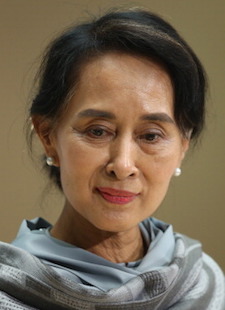 Daw Aung San Suu Kyi (pronounced Daw Aung San Sue Chee) is a Buddhist peace activist and democracy advocate. She lives in the country of Myanmar , which was formerly called Burma . She received a Nobel Peace Prize in 1991 from the Norwegian Nobel Committee for her commitment to freedom and democracy for her people. Aung San Suu Kyi received the American Presidential Medal of Freedom in 2000, America ’s highest civilian honor. In December 2004, Thailand awarded her with an honorary doctorate from Rangsit University for her commitment to the principles of democracy, human rights and freedom. Her awards are numerous, yet she is forbidden from leaving her country to receive any of them, and for years has been under house arrest. She writes regarding her analysis of female / male relations as follows: “The dawn rises only when the rooster crows. … It crows to welcome the light that has come to relieve the darkness of night. It is not the prerogative of men alone to bring light to the world: women with their capacity for compassion and self-sacrifice, their courage and perseverance, have done much to dissipate the darkness of intolerance and hate, suffering and despair."